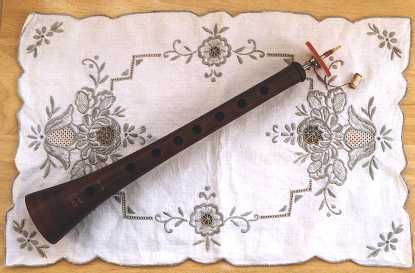 The Zurna (pronounced zewer-na), like the duduk and shvi, is a woodwind instrument used to play Armenian folk music. The zurna is a conical oboe, made of apricot wood, and uses a double reed which generates a sharp, piercing sound. Thus, it has historically been played outdoors during festive events such as weddings and holidays. It has 8 holes on the front, 7 of which are used while playing, and 1 thumbhole which provide a range of one octave. Typically, the zurna is played in pairs with the lead zurna playing the melody and the second zurna playing a sustained pitched called the dam. The dam is a tonic drone that serves as a constant counterpoint to the melody. 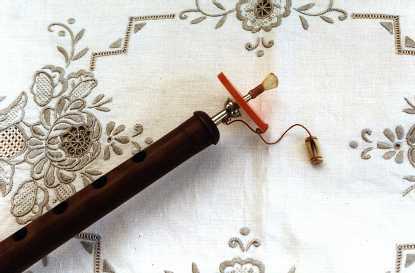 The drone is maintained by using a circular breathing technique which involves inhaling through the nose and storing the air in puffed up cheeks while maintaining lip pressure on the reed. The lively melodies played on the zurna are usually accompanied by the dhol, the double-sided Armenian drum. The dhol is known for providing upbeat Armenian dance rhythms. 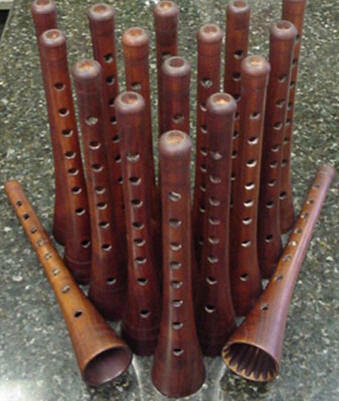 The zurna is believed to have originated in China, and variations of the zurna appear in the musical cultures of all Middle Eastern and Central Asian countries. Where to buy a zurna? If you can not make it to the Vernisage, the famous outdoor shopping market that takes place every Saturday in Yerevan, the capital of Armenia, you can buy a quality Armenian zurna at the Armenian Music Instruments web site. This site sells zurnas created by Master Souren, who signs "SAM" on each zurna and also makes other woodwind instruments. There is also a section that presents excellent technical information about the zurna that can be printed. Yeghish - "Yeghish", Parseghian Records, 1993. Woodwind master Yeghish displays his extraordinary talents on zurna, duduk, and clarinet. Various Artists - "Kalaschjan - Rural and Urban Traditional Music from Armenia", Weltmusic, 1992. A live performance in Germany of the top musicians from Armenia are preserved on this digitally recorded CD.